One of the most famous people in ancient China was a wise philosopher named Confucius - also Kong Zi, Kong Qiu, or Zhong Ni. Confucius was a Chinese thinker and social philosopher, whose teachings and philosophy have deeply influenced Chinese, Korean, Japanese and Vietnamese thought and life. His philosophy emphasized personal and governmental morality, correctness of social relationships, justice and sincerity. These values gained prominence in China over other doctrines, such as Legalism or Taoism during the Han Dynasty (206 BCE - 220 CE). Confucius' thoughts have been developed into a system of philosophy known as Confucianism. 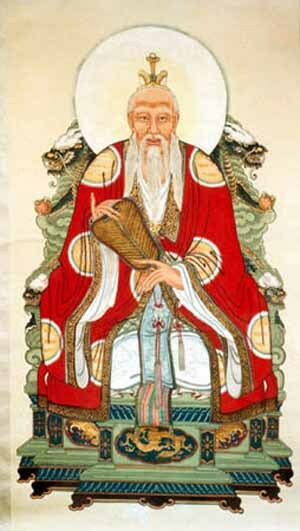 It was introduced to Europe by the Italian Jesuit Matteo Ricci, who was the first to Latinize the name as "Confucius." His teachings may be found in the Analects of Confucius, a collection of "brief aphoristic fragments", which was compiled many years after his death. For nearly 2,000 years he was thought to be the editor or author of all the Five Classics such as the Classic of Rites, and the Spring and Autumn Annals. 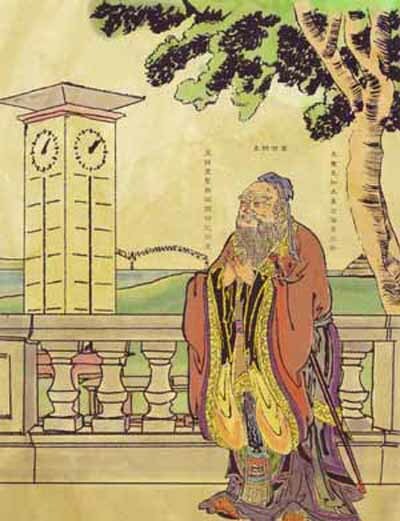 In the Analects, Confucius presents himself as a "transmitter who invented nothing". He puts the greatest emphasis on the importance of study, and it is the Chinese character for study (or learning) that opens the text. In this respect, he is seen by Chinese people as the Greatest Master. Far from trying to build a systematic theory of life and society or establish a formalism of rites, he wanted his disciples to think deeply for themselves and relentlessly study the outside world, mostly through the old scriptures and by relating the moral problems of the present to past political events (like the Annals) or past expressions of feelings by common people and reflective members of the elite, preserved in the poems of the Book of Odes. Confucius was born in the state of Lu. His original name was K'ung Ch'iu. 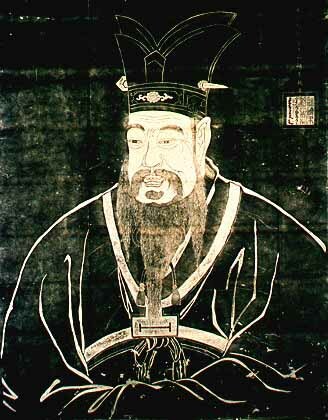 His father, commander of a district in Lu, died three years after Confucius was born, leaving the family in poverty; but Confucius nevertheless received a fine education. He was married at the age of 19 and had one son and two daughters. He worked as a keeper of a market. Then he was a farm worker who took care of parks and farm animals. When he was 20, he worked for the governor of his district. His mother died in 527 BC, and after a period of mourning he began his career as a teacher, usually traveling about and instructing the small body of disciples that had gathered around him. His fame as a man of learning and character and his reverence for Chinese ideals and customs soon spread through the principality of Lu. 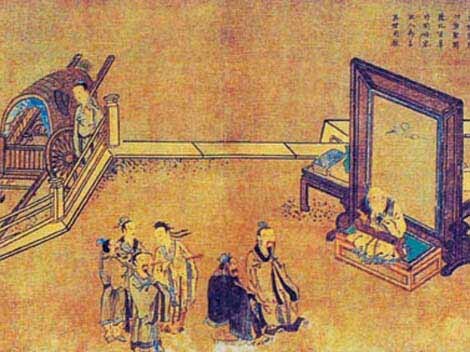 Living as he did in the second half of the Zhou (Chou) dynasty (1027?-256 BC), when feudalism degenerated in China and intrigue and vice were rampant, Confucius deplored the contemporary disorder and lack of moral standards. He came to believe that the only remedy was to convert people once more to the principles and precepts of the sages of antiquity. He therefore lectured to his pupils on the ancient classics. Confucius taught in his school for many years. His theories and principles spread throughout China by his disciples, and soon many people learned from his wise sayings. The concept of time and its movements was of great interest to him. What seems a matter of tiny importance has been long commented on and shows another of the Confucian specificities that have to be underlined. When one knows that in his time horses were perhaps ten times more expensive than stablemen, one can understand that, by not asking about the horses, Confucius demonstrated his greatest priority: human beings. 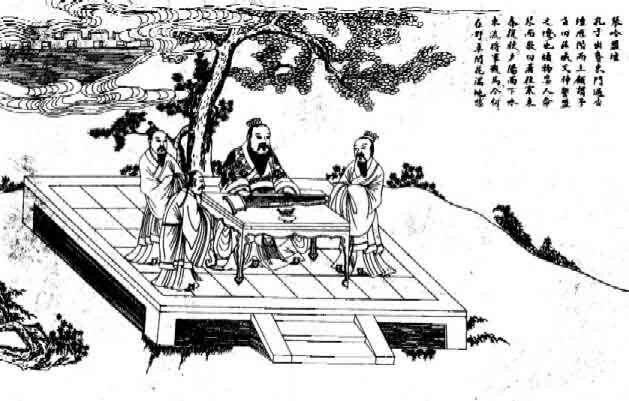 Thus, when one sees a little bit of the greater picture, according to many ancient or recent Eastern and Western commentators, Confucius' teaching can be considered a noteworthy Chinese variant of humanism. 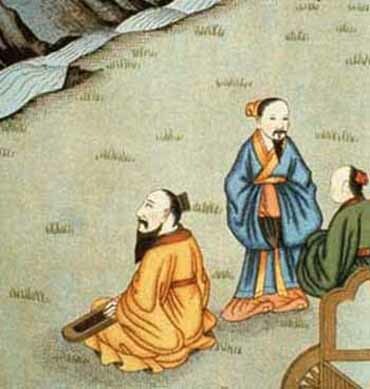 Confucius also heavily emphasized what he calls "rites and music," referring to these social conventions as two poles to balance order and harmony. While rites, in short, show off social hierarchies, music unifies hearts in shared enjoyment. He added that rites are not only the way to arrange sacrificial tools, and music is not only the sound of stick on bell. Both are mutual communication between someone's humanity and his social context, both feed social relationships, like the five prototypes: between father and son, husband and wife, prince and subject, elder and youngster, and between friends. Duties are always balanced and if a subject must obey his ruler, he also has to tell him when he is wrong. Confucius' teachings have been turned later into a corps de doctrine by his numerous disciples and followers. 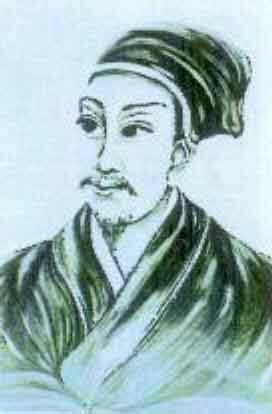 In the centuries after his death, Mencius and Xun Zi both wrote a prominent book on these, and with time a philosophy has been elaborated, which is known in the West as Confucianism. Although Confucianism is often followed in a religious manner by the Chinese, argument continues over whether to refer to it as a religion because it makes little reference to theological or spiritual matters (Gods and the afterlife). Confucius's principles gained wide acceptance primarily because of their basis in common Chinese opinion. He championed strong familial loyalty, ancestor worship, and respect of elders by their children and of husbands by their wives, and used the family as a basis for an ideal government. He expressed the well-known principle, "Do not to others what you do not want done to yourself" (the Golden Rule). He also looked nostalgically upon earlier days, and urged the Chinese, particularly the politicians, to model themselves on earlier examples - although whether or not older rulers had governed by Confucian standards is dubious. 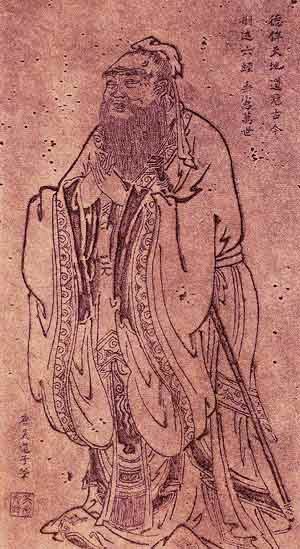 Confucius' political thought is based upon his ethical thought. He argues that the best government is one that rules through "rites" and people's natural morality, rather than using bribery and force. He explained this in one of the most important analects:"If the people be led by laws, and uniformity sought to be given them by punishments, they will try to avoid the punishment, but have no sense of shame. If they be led by virtue, and uniformity sought to be given them by the rules of propriety, they will have the sense of shame, and moreover will become good." This "sense of shame" is somewhat an internalization of duty, where the punishment precedes the evil action, instead of following it in the form of laws as in Legalism. While he supported the idea of the all-powerful Emperor, probably because of the chaotic state of China at his time, his philosophies contained a number of elements to limit the power of the rulers. He argued for according language with truth - thus honesty was of the most paramount importance. Even in facial expression, one sought always to achieve this. In discussing the relationship between a son and his father (or a subject and his king), he underlined the need to give due respect to superiors; this demanded that the inferior must give advice to his superior if the superior was considered to be taking the wrong course of action in a given situation. 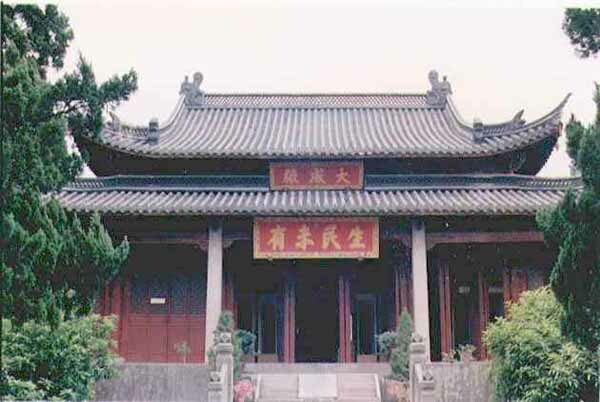 This was built upon by his disciple Mencius to argue that if the king was not acting like a king, he would lose the Mandate of Heaven and be overthrown. Therefore, tyrannicide is justified because a tyrant is more a thief than a king (but attempted tyrannicide is not). 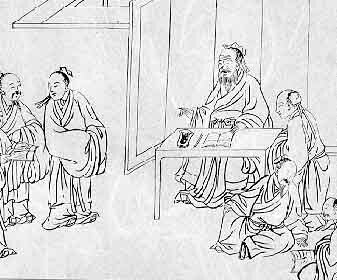 Confucius' philosophical school was first continued by his direct disciples and by his grandson Zisi. Mencius and Xun Zi are his two great followers, one on each "side" of his philosophy, perhaps simply described as optimism and pessimism. They built upon and expanded his ethico-political system. 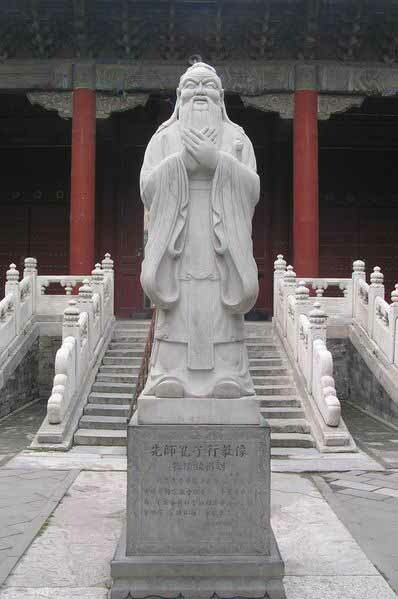 Soon after Confucius' death, Qufu, his hometown, became a place of devotion and remembrance. It is still a major destination for cultural tourism, and many Chinese people visit his grave and the surrounding temples. 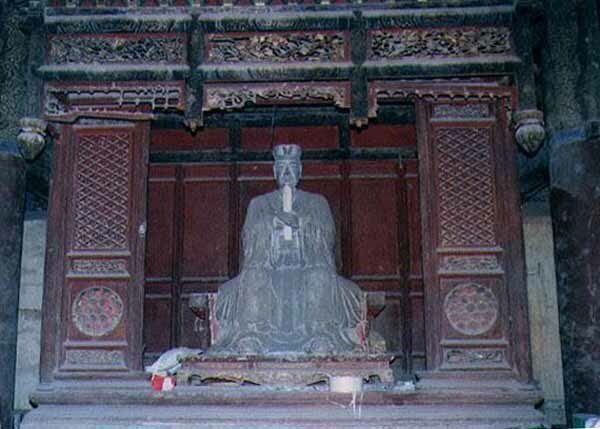 In China, there are many temples where one can find representations of Buddha, Lao Zi and Confucius together. 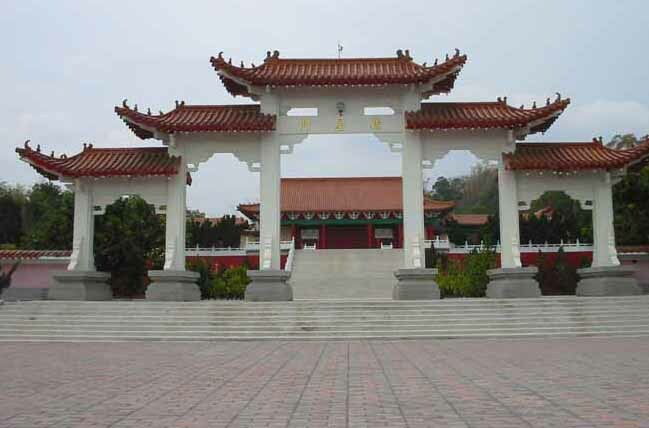 There are also many temples dedicated to him which have been used for Confucianist ceremonies. 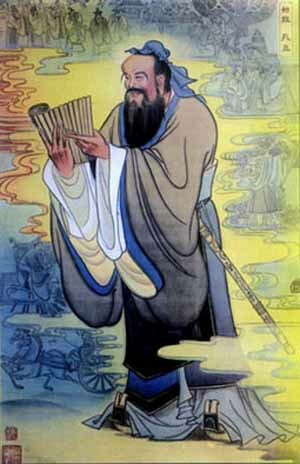 Confucius not only said interesting things, he sang them and accompanied himself on a kind of zither. The Smithsonian Institution's Arthur M. Sackler Gallery is opening a show Saturday of musical instruments from Confucius' time, 2,500 years ago. A collection of his lyrics - unfortunately there are no melodies - is one of the first pieces of Chinese literature handed down through the centuries. "It is said that Confucius accompanied himself on a 'qin' while singing the odes of the Shi Jing, or the 'Classic of Poetry,'" says cellist Yo-Yo Ma in a guide to the exhibit. "We don't know what Confucius' qin may have looked like, but in popular accounts of his life, the image of the philosopher-musician became firmly established." 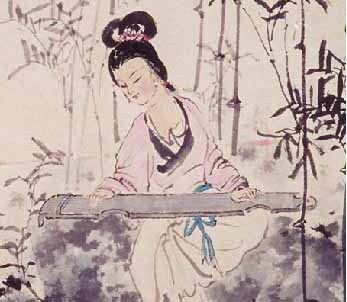 The qin is a kind of zither. Today's Chinese musicians still use one kind. Ma is an American of Chinese ancestry, one of today's leading cellists playing classical western music. Jenny F. So, the Sackler's curator of ancient Chinese art, said in an interview that some of the "odes" were just folk songs. Confucius reportedly made a practice of dancing with his disciples every day. In his time, music was considered of great social significance, linking rulers to subjects, parents to children. "It is by poetry that one's mind is aroused; it is by ceremony that one's character is regulated; it is by music that one becomes accomplished," he said. Most of the instruments on display come from a tomb of the Marquis Yi, found by Chinese soldiers in 1977 when they were leveling a hill as a site for a factory. The instruments are borrowed from a museum in Hubei, China. So said this is the first time they have been displayed in a musical context. Confucius had definite ideas about what music ought to be. "Get rid of the tunes of Zheng," he is quoted as saying. "The tunes of Zheng are lascivious." The Zheng area lies just to the south of Lu, Confucius' home state. A later chronicler, who So says may have been using his imagination some, told of a Chinese king who was fond of licentious music. "He assembled a large company of musicians and actors at the Shaqiu garden," says the account, "filling a pond with wine and hanging up meats to make a forest. He caused men and women to disrobe and pursue each other through this scenery, as part of a drinking feast lasting long into the night." A costumed musician, Mei Min Su of the local Chinese Music Society, played more recent Chinese music for visitors before the official opening, on a zither like one from Confucius' time. The marquis apparently had two sets of musicians: one for public ceremonials, which emphasized percussion instruments, and a smaller, more intimate one with strings. Chinese authorities considered his ceremonial set of 65 huge bronze bells too precious to leave the country. Inscriptions on them identify the notes they produce on the Chinese five-tone scale. So far as scholars can find, it took nearly another thousand years before actual tunes were written out, Su said. In one chamber of the tomb archaeologists found an elaborately lacquered double coffin with the body of a middle-aged man, presumably the marquis. Eight smaller coffins contained the skeletons of eight young women.